Weight-loss program participants who were guided by health coaches lost more than 9 percent of their body weight during a 24-week period. While there is clearly no magic bullet to successfully losing weight, a new study suggests that health coaches may be the next best thing. Researchers from The Miriam Hospital’s Weight Control and Diabetes Research Center in Providence, R.I., conducted a randomized controlled pilot study to determine the impact of health coaches, peer coaches and mentors on a group of 44 obese participants. The subjects were enrolled in a group behavioral weight-loss program that met 12 times over the course of 24 weeks: weekly for the first six weeks; biweekly for the following six weeks; and monthly thereafter. Participants were randomly assigned to work with either a professional health coach, a fellow group member (peer) or someone who had successfully lost a significant amount of weight (mentor). The coaches communicated with their participants during the weeks there were no group meetings and provided feedback on participants’ weekly weight, caloric intake and physical-activity logs. After 24 weeks, all three groups had lost a significant amount of weight, but those who worked with a professional health coach or a peer lost an average of more than 9 percent of their total body weight (compared to 6 percent of those who worked with a mentor), and at least half of were able to lose 10 percent or more of their body weight. This number is significant in that this amount of weight loss has been shown to reduce the risk of numerous obesity-related diseases, such as diabetes and heart disease. Just 17 percent of those who worked with a mentor were able to achieve a weight loss of 10 percent or more. Could Health Coaches Be the Answer to America’s Obesity Epidemic? Demand for fitness professionals is predicted to grow by 24 percent over the next seven years. This increased demand is expected to come primarily from business, health professionals and insurance companies aiming to reduce the prevalence of obesity and sedentary lifestyles and their negative effects on health. The study, which was funded by the National Institutes of Health and published in the July 26, 2012, online edition of the journal Obesity, demonstrates the important role health coaches can play in helping people lose weight. It’s no secret that the U.S. is facing an unprecedented health crisis due to the dramatic rise in overweight and obesity, with two out of three Americans now classified as overweight or obese. But rather than continuing to focus on the problems caused by the obesity epidemic, qualified health coaches have an opportunity to actually do something about it—to be the solution for so many people who desperately want to lose weight and live healthier lives, but simply don’t know where to start. Health coaches don’t focus solely on things like reducing calories or increasing exercise. Instead, they teach the principles of behavioral modification and help clients overcome the psychological barriers that keep them from achieving their goals on a daily basis. They also do an effective job of convincing clients that, to really make permanent and positive changes in their lives, they must commit to working toward living a healthier lifestyle today, tomorrow and for the rest of their lives. And that’s the key for everyone, whether or not weight loss is the goal. Health coaches are trained to help clients address the behavioral factors and habits that affect a wide range of issues, such as smoking, inactivity and stress. From the overworked executive to the first-time mother adjusting to life with a newborn, health coaches can offer the guidance and tools these individuals need to overcome their challenges and regain a greater level of health and well-being. In a recent interview with Fox News, ACE Chief Science Officer Dr. Cedric X. Bryant explained that the obesity epidemic has increased the demand for qualified health and fitness professionals who can help people make better lifestyle choices. And, as this study shows, health coaches have the experience and knowledge to connect with clients on a personal and meaningful basis, which is an effective way to help them really buy in to making the changes that lead to lasting weight loss and improved health and well-being. And that means that health coaches, explains Bryant, have the potential to not only help their clients lose weight or live more healthfully, but to be life changers as well. If you are a fitness, wellness, healthcare, human resources or allied health professional looking to more effectively help people reach their health and weight-loss goals, consider becoming an ACE-certified Health Coach. In addition to helping you grow professionally, this certification will make you more attractive to both corporations looking to improve the health of their employees and to health clubs looking for qualified managers to lead their companies. 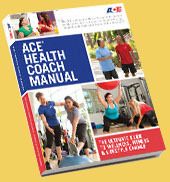 From now until September 30, 2012, ACE is offering a special pre-sale opportunity of 20% off one of two ACE Health Coach bundles. Both the Standard and Premium options feature a toolbox of study resources including the new ACE Health Coach Manual featuring content by award-winning personal trainer Jonathan Ross, behavioral psychologist Michael Mantell, Ph.D., and registered dietitian Natalie Digate Muth, M.D., M.P.H. For more information about this exciting new opportunity to expand your professional reach, contact us at 888-825-3636, Ext. 782, or help@ACEfitness.org. Chia Seeds: The Newest Ancient Superfood? You already know the essentials of exercise science, program design and what it takes to build a relationship with your client. Now go further. Becoming an ACE-certified Health Coach will help you expand your knowledge of fitness and nutrition, and teach you how to truly maximize the strong relationships you already have with your clients. Mark your calendars for the 2013 ACE Symposium, which will be held on both the West Coast and East Coast next year. Check out some of the details and how you can stay up-to-date on the latest news and pre- and post-conference workshop announcements. You share your knowledge and important tips with your clients during their sessions, but what if you could provide them with information that will help them every day? And perhaps just as important, can you grow your business by sharing that information? Connecting with potential and current clients online can take you to a whole other level when it comes to your business. Check out our 9 rules for using the Web to turn a profit.